Anyway, I have recently got back from Germany. Good fun appeared to be had by all. 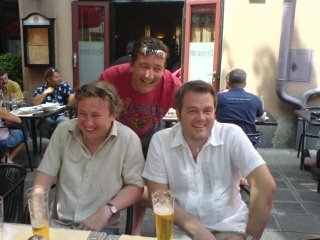 I met Tony in Munich and we rented a car to drive down to Nuremburg for England v Trinidad & Tobago. The match was failry poor to be honest (as you all have probably seen) but it was fun. Whilst there, we met up with John (Oscar, left) and Mark (Centre). Tony is on the right. Nuremburg is actually a very beautiful place which I must be honest, came as a bit of a suprise to me. The hosts were very welcoming and the Poliec seemed to adopt a fairly relaxed approach which led to a trouble free few days. You hear horror stories on the police being heavy handed in these situations but they handled the matter perfectly and the fans seemed to respond accordingly. Unfortunately I hear last night that there was a lot of trouble in Stuttgart which is a great shame. Whilst the trip was good, the journey back was a little stressful. I arrived back in Athens and waited for my plane. I went to check in only to be told that they had over sold the plane and the last five people would not be getting on! I mean theplane only hold maybe 30-40 anyway, it is a small island hopper. To put it mildly I was not impressed. They gave me 250 euros by way of compensation and a free flight the following day, also a hotel. I took the money and said something along the lines of "You jolly nice people can keep your hotel and free plane journey, I like you all very much". Well, something similar anyway.. Anyway, a few phots will be posted shortly from the German trip. Not great quality as they were with my phone. So, Vegas is now only a couple of weeks away. Im excited about the trip but dreading the journey. As most will know, I am not a huge fan of flying at the best of times but all the way to Vegas again does not fill me full of confidence.